Accept Credit Card payments with Authorize.Net secure card processing. Let your customers pay without leaving your website! SSL certificate is required to ensure your customer credit card details are safe. 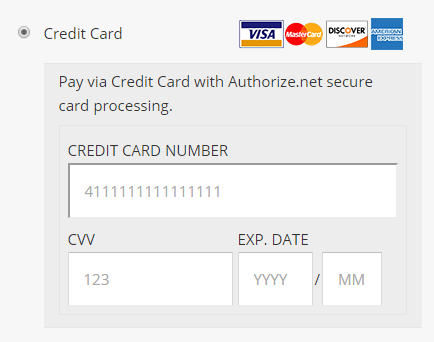 Once the user fills the credit card info the payment is processed in the background. Once the payment is processed successfully the user is redirected to the thank you page. During the whole payment process the user stays on the website without going to any external payment form. All the credit card info is passed directly to the Authorize.Net servers without reaching your server. Integrating the Accept.js library into your application helps minimize your PCI compliance because it sends payment data directly to Authorize.Net. Payment data submitted through Accept.js does not reach your server. Accept.js also provides the ease of flexibility of your own design and form.